Cleaning detergent for roofs.Apply the cleaning detergent with the Roof Cleaner, preferably on a damp surface. For a long-term effect, avoid spraying when rain is expected in the next few days. 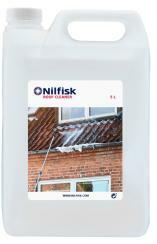 Application with Nilfisk Roof Cleaner. Coverage: Approx 125 m2 per 5 litres. Must be applied at temperature of min 5 degrees Celsius and will take effect after 3-4 months. Can also be used to remove dirt coating on exterior pavers or wood surfaces. Roof Cleaner is a very efficient detergent to remove dirt from the roof.